The Griffin (sometimes spelled gryphon or griffen, gryphos in Ancient Greek or شیردال shirdal in Persian) is a legendary creature with the body of a lion and the head and wings of an eagle. Seen as guardians of secretly buried wealth, the griffin evolved from a ferocious animal of antiquity to become a symbol of strength and valor. 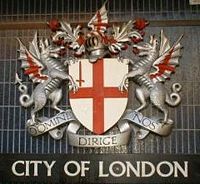 It is one of the most common mythical creatures to appear in heraldic images, fittingly representing the hoped for nobility of leaders in human society. Griffins have had a rather consistent physiology throughout the ages. They are generally depicted with four legs, two wings, and a beak, with eagle-like talons in place of a lion's forelegs and feathered, and equine-like ears jutting from the skull. Among the few variations are those traditions claiming that only the females had wings and others indicating that the griffin's tails are serpent-like. One suggested set of associations extends from the rich fossil beds around the Mediterranean across the steppes to the Gobi Desert and on to the myths of griffins, centaurs, and archaic giants originating in the classical world. Classical folklorist Adrienne Mayor draws upon similarities between the skulls of Protoceratops living millions of years ago in the steppes leading to the Gobi Desert, and the legends of the gold-hoarding griffin told by nomadic Scythians of the region. While it is possible that ancient cultures devised griffin legends from the fossils of actual animals, it is more likely that the griffins were creations of myth and symbolism. 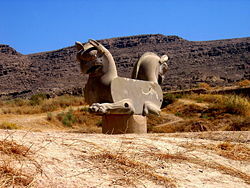 The earliest references to griffins come out of ancient Persia. In Persian mythology, in particular during the Achaemenid Empire, griffins or Homa were used widely as statues and symbols in palaces. Homa also had a special place in Persian literature as guardians of light. In Ancient Egypt, griffins were depicted with a slender, feline body and the head of a falcon. Early statuary depicts them with wings that are horizontal and parallel along the back of the body. During the New Kingdom, depictions of griffins included hunting scenes. Several figures in Egyptian mythology were depicted as griffins, including Sefer, Sefert, and Axex. Griffins were also sometimes seen as pulling the chariot of the pharaohs. Tales of griffins and the Arimaspi of distant Scythia near the cave of Boreas, the North Wind (Geskleithron), were elaborated in the lost archaic poem of Aristeas of Proconnesus, Arimaspea, and eagerly reported by Herodotus and in Pliny's Natural History. The griffin was said to build a nest, like an eagle. Instead of eggs, it laid agates. The animal was supposed to watch over gold mines and hidden treasures, and to be the enemy of the horse. Griffins were consecrated to the Sun; and ancient painters represented the chariot of the Sun as drawn by griffins. The griffin was a common feature of "animal style" Scythian gold; it was said to inhabit the Scythian steppes that reached from the modern Ukraine to central Asia; there gold and precious stones were abundant; and when strangers approached to gather the stones, the creatures would leap on them and tear them to pieces. Elsewhere in Ancient Greek mythology, the griffins were said to be "the hounds of Zeus," but were also associated with Nemesis, the goddess of retribution, as well as the god Apollo. Ancient Elamites used griffin symbolism extensively in their architecture. In Elam legends, a Griffin was presented to Elamite Gods. 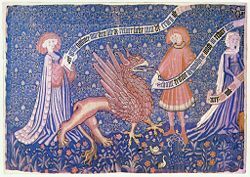 The griffin continued to be largely represented in the fine arts in Europe, such as tapestries and illustrations, but later on also began to take on Christian symbolism as well. The dual nature of the griffin was often seen as mirroring the dual nature of Christ, particularly because a griffin flew in the sky as easily as it walked on the ground, reflecting Christ's divine and human qualities. In English literature, the griffin became seen as a symbol of fidelity—griffins had one mate for life, and if one died, the other never mated again. In architectural decoration the griffin is usually represented as a four-footed beast with wings and the head of a leopard or tiger with horns, or with the head and beak of an eagle. 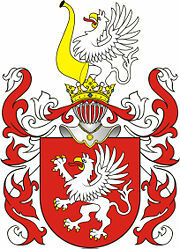 The griffin is often seen as a "charge" in heraldry. 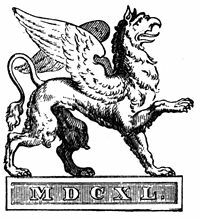 In the late fourteenth century, John de Bado Aureo wrote "A Griffin borne in arms signifies that the first to bear it was a strong pugnacious man, in whom were found two distinct natures and qualities, those of the Eagle and the Lion." 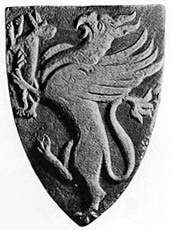 Heraldic griffins are usually shown rearing up, facing left, and standing on one hind leg with the other leg and the claws raised: this posture is described in the Norman-French language of heraldry as segreant, a word uniquely applied to griffins, and which is the exact equivalent of the description of lions and other creatures in heraldry as rampant. The griffin has appeared in various types of literature. Echoing the classical depictions, in Dante Alighieri's Purgatorio a griffin pulled the chariot that brought Beatrice to Dante in Canto XXIX. A griffin (spelled "gryphon") is featured in Lewis Carroll's Alice in Wonderland in which the Queen of Hearts' orders the gryphon to take Alice to see the Mock Turtle and hear its story. For a young generation in nineteenth-century England, Sir John Tenniel's illustration depicting the gryphon in an unusually naturalistic style, brought into popular culture the new idea of the griffin as part of a childlike fantasy world, akin to unicorns or elves. A griffin-like creature also appears in Maurice Sendak's classic Where the Wild Things Are. Many pop culture publications that incorporate classical elements, such as Dungeons and Dragons, also use representations of griffins. ↑ Crystal, Ellie. Griffins: The Eagle and the Lion. Access date: February 9, 2007. ↑ The Gryphon In Heraldry. Access date: February 19, 2007. ↑ Milton, John. 1667. Paradise Lost. Book II, lines 943-950. This page was last modified on 17 July 2017, at 21:35.